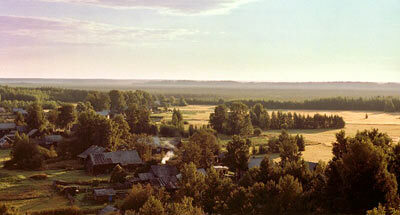 Darvinsky Zapovednik is situated in Yaroslavskaya and Vologodskaya Regions. 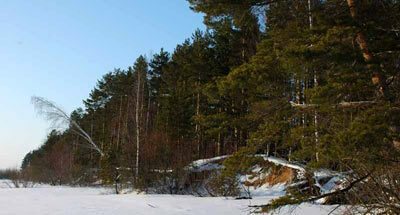 The Zapovednik was founded in 1945 for the purpose of studying the stages of the Rybinskoye water reservoir's development and its influence on natural systems. The area is 112.6 thousand ha including 45.4 of reservoir. The relief is valley. 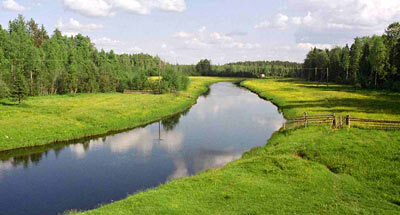 More than 80% of the area is occupied by marshes and paludal forests. Host frequently occuring are high muskegs with light pine forests and a grass-bush belt formed of Chamaedaphne, Andromeda, Ledum palustre, blueberry, cranberry, Rubus. Pine forests include lichen, true moss, bilberry, and cowberry with an undergrowth of juniper. Birch forests are met, often paludal; spruce forests are less numerous. The zone of periodical inundation is covered by coastal water plants. For the water are risen peat islands are characteristic. Flora accounts for 590 vascular plant species including some which are rare (yellow lady's slipper, Epipogium aphyllum, etc.). Mammal fauna makes up 37 species. Elk, wild boar, brown bear, wolf, fox, badger, common weasel, and alpine hare are common; lynx and otter are rare. Ornithofauna includes more than 230 species of nesting and migratory birds. Hazel grouse, wood grouse, and Pensoreus infaustus are met; black grouse and rype are numerous. Waterfowl is numerous, with ducks, gulls, and shore-birds. During migration white-fronted goose, bean goose, whooper swan stop in the Zapovednik. Rare species nest, particularly golden eagle, fish hawk, and white-tailed eagle. Of reptile species asp and common lizard are wide-spread. In rivers and lakes bream, zander, pickerel, and burbot live. There is a small forested area, where representatives of Far-East, Siberian, and Western- and Central-European flora grow (cedar, Manchurian walnut, Betula costata, large-leaved lime, etc. ).